I know how important your motorcycle is to you. Years spent dreaming, researching, saving money, and waiting patiently for the right time in your life to own that machine. It’s often the center of the rider’s free time and lifestyle. Keeping your motorcycle in showroom condition (or better) is part of the obsession. Motorcycle detailing is a labor-intensive and extremely time-consuming task that is best left to an experienced professional. As owner of Speedway Detail, I have over 25 years of experience with heavy motorcycles. You can rest assured your machine will be given world-class treatment while in my care. 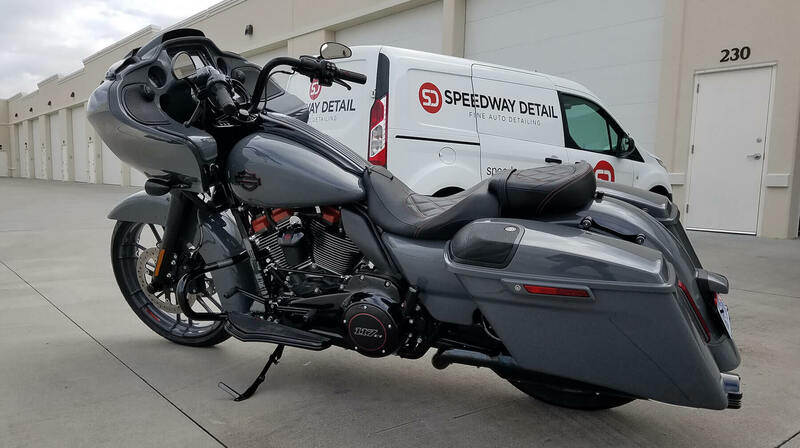 Speedway Detail offers the complete line of Optimum Polymer Technologies ceramic clear coat systems for your motorcycle. These coatings represent the best protection against UV fading & oxidation, and chemical etching caused by bird droppings, insects, tree sap, and other contaminants. ​Additionally, your motorcycle will stay cleaner between washes as contaminants will not easily bond with the surface. Opti-Coat ceramic coatings last for years, and make maintenance washes a BREEZE! Speedway Detail also offers maintenance wash & annual detailing services for your motorcycle. Our maintenance detailing services are performed with the same techniques, tools, and boutique chemicals as we use in our premium car detailing services, so you know that your motorcycle will be held to a high standard. Maintenance detailing services are available via our mobile detailing vehicle at your location, for your convenience. Prices are quoted individually.